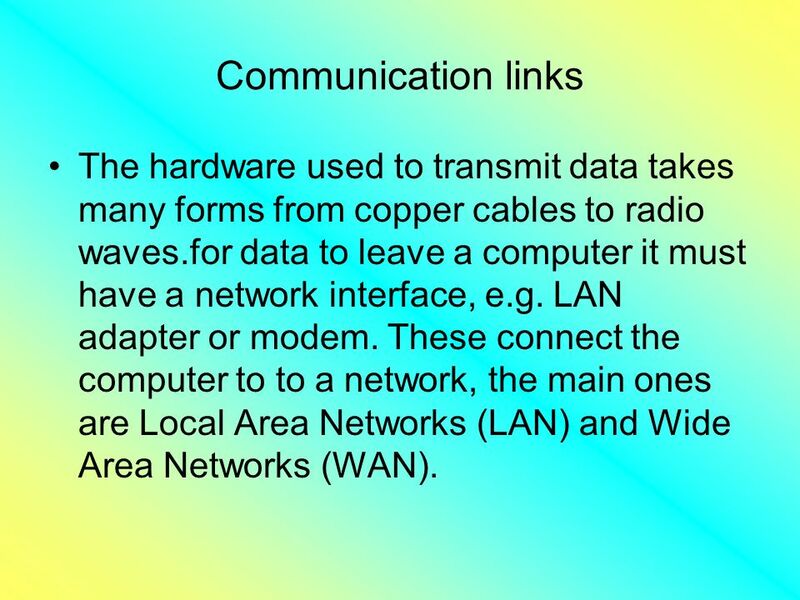 Purpose of the Main Components of an Information System Hardware, Software and Communication Links. 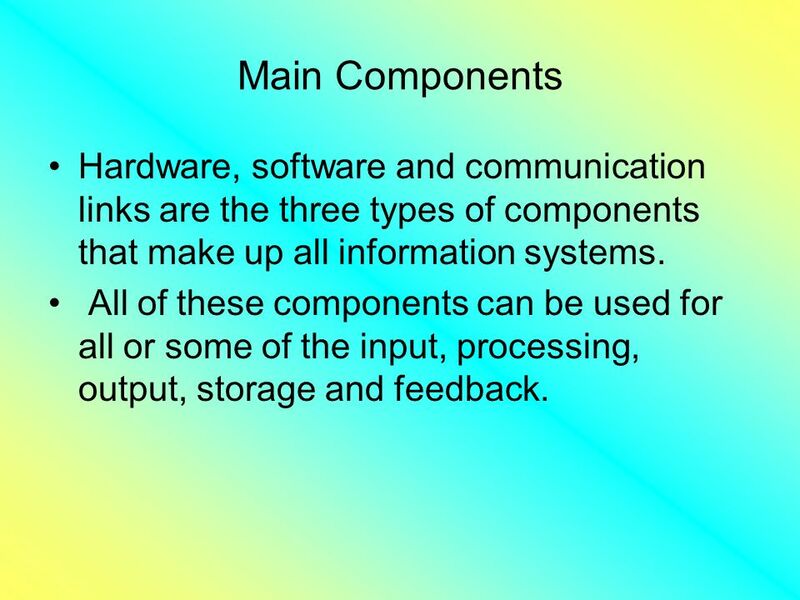 2 Main Components Hardware, software and communication links are the three types of components that make up all information systems. All of these components can be used for all or some of the input, processing, output, storage and feedback. 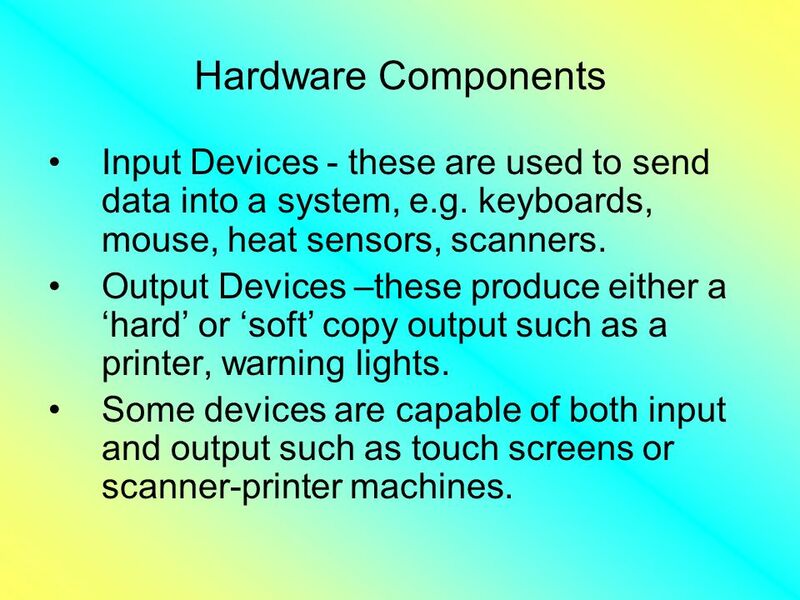 3 Hardware Components Input Devices - these are used to send data into a system, e.g. keyboards, mouse, heat sensors, scanners. Output Devices –these produce either a hard or soft copy output such as a printer, warning lights. Some devices are capable of both input and output such as touch screens or scanner-printer machines. 4 Hardware Components Processing devices – these follow a set of instructions on what to do with data. Storage Devices – these hold data for a purpose, this is both backing store and working memory. Backing store includes magnetic media which can be recorded on and rerecorded on e.g. tape, floppy disks, hard disks, and optical media such as CDs and DVDs. 5 Software Components There are two main types of software: applications programs, these are needed to perform end user tasks that would have to be done even if the computer did not exist such as spreadsheets and word processors. Applications software requires the other main type of software, systems software, to function. The systems software controls the hardware and any other software. 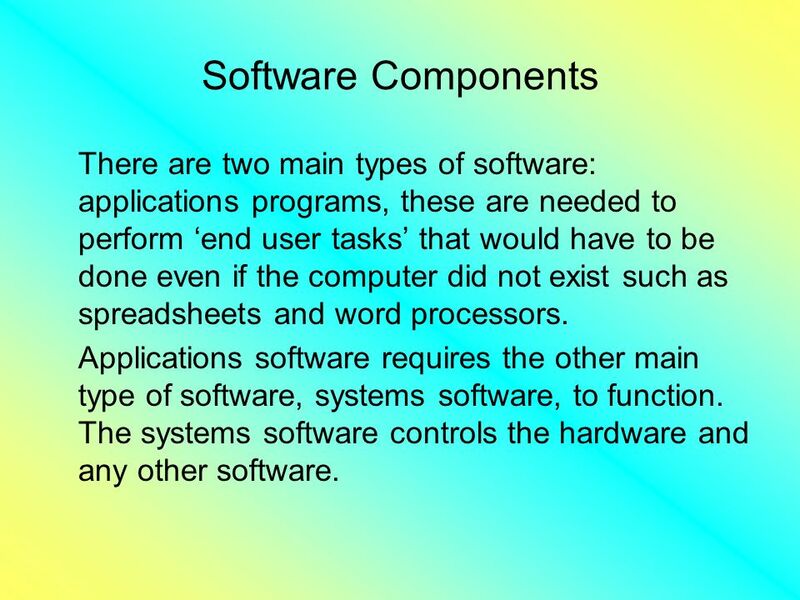 6 Software Components Systems Software Operating Systems – these co-ordinate everything else on the computer and must be running in order for anything else to function. 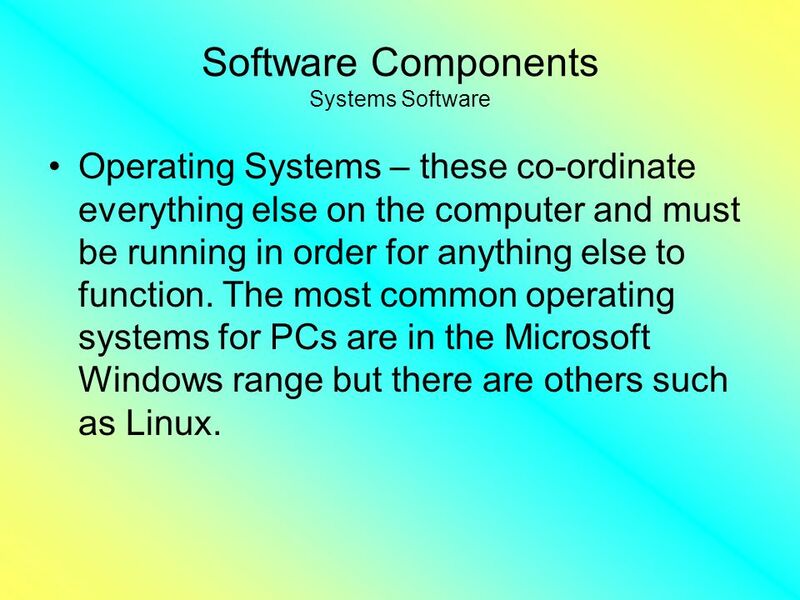 The most common operating systems for PCs are in the Microsoft Windows range but there are others such as Linux. 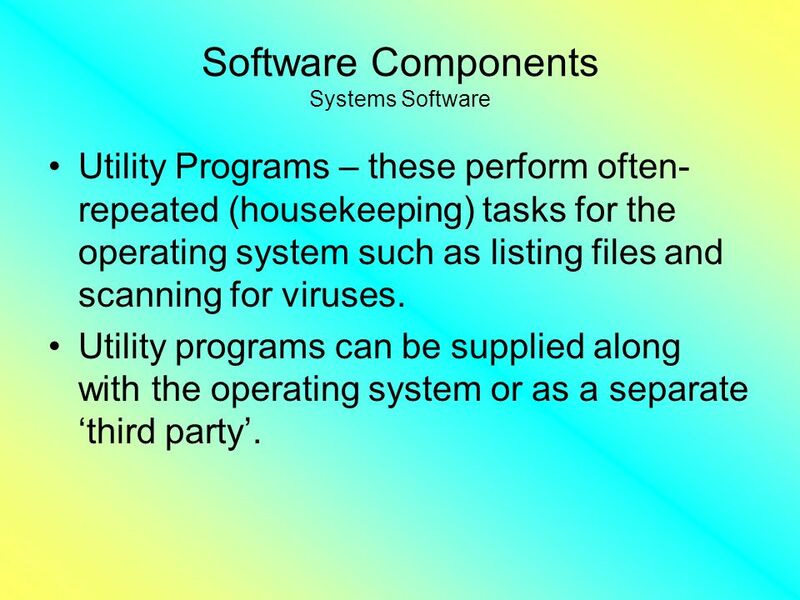 7 Software Components Systems Software Utility Programs – these perform often- repeated (housekeeping) tasks for the operating system such as listing files and scanning for viruses. Utility programs can be supplied along with the operating system or as a separate third party. 8 Software Components Software can be designed to meet the needs of large amounts of people or it can be tailor made to meet the needs of an individual person or task. 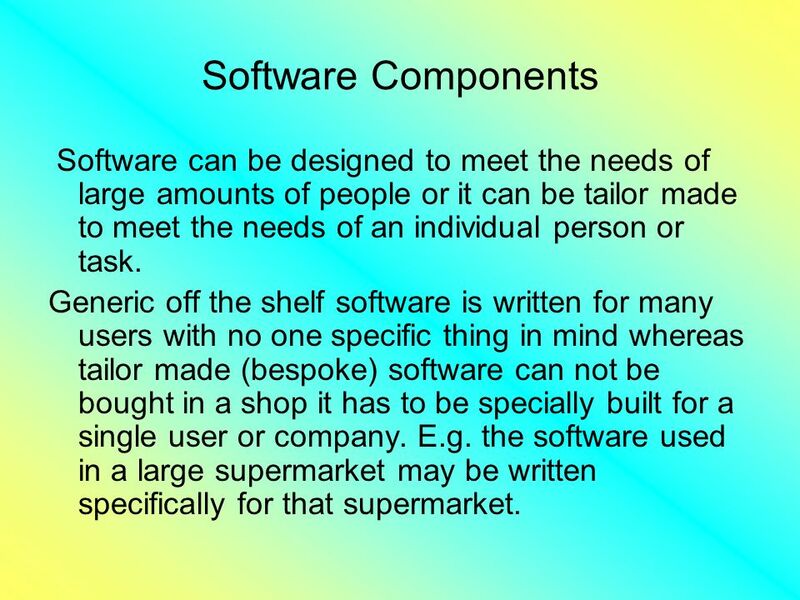 Generic off the shelf software is written for many users with no one specific thing in mind whereas tailor made (bespoke) software can not be bought in a shop it has to be specially built for a single user or company. E.g. the software used in a large supermarket may be written specifically for that supermarket. 9 Communication links The hardware used to transmit data takes many forms from copper cables to radio waves.for data to leave a computer it must have a network interface, e.g. LAN adapter or modem. These connect the computer to to a network, the main ones are Local Area Networks (LAN) and Wide Area Networks (WAN). 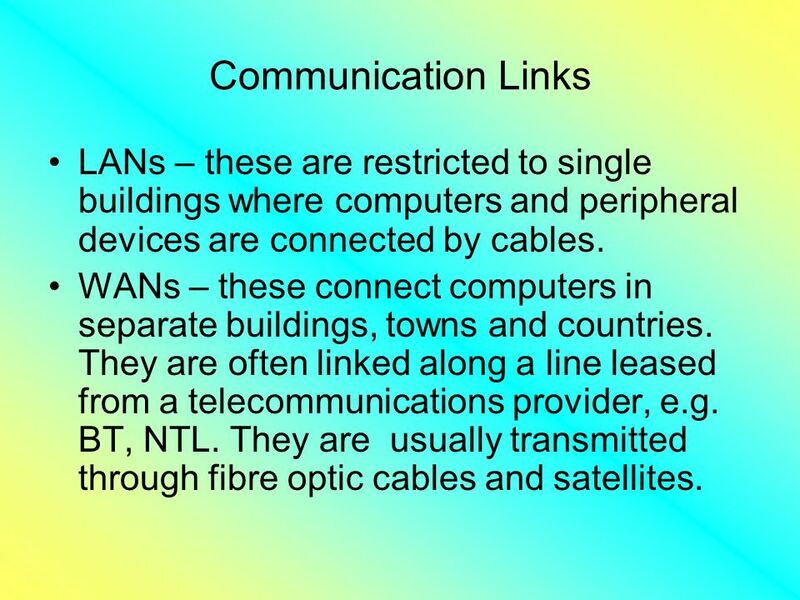 10 Communication Links LANs – these are restricted to single buildings where computers and peripheral devices are connected by cables. WANs – these connect computers in separate buildings, towns and countries. They are often linked along a line leased from a telecommunications provider, e.g. BT, NTL. They are usually transmitted through fibre optic cables and satellites. 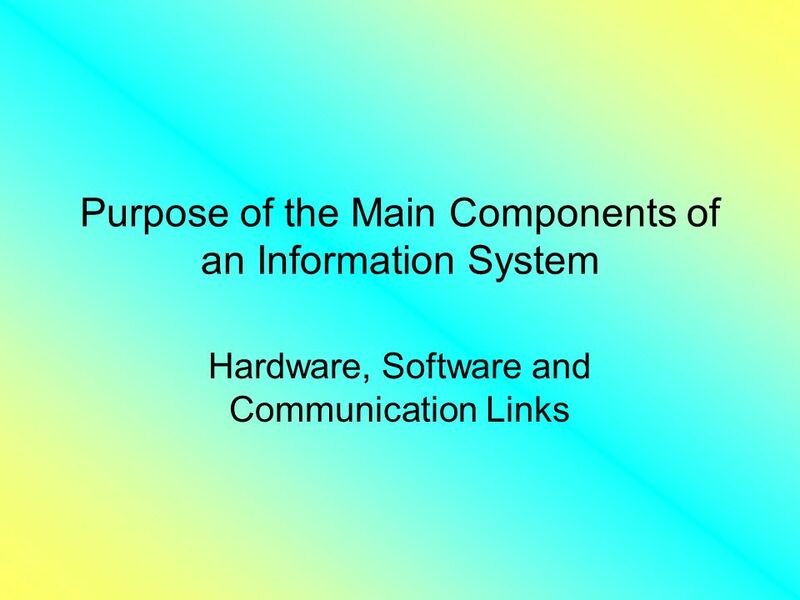 Download ppt "Purpose of the Main Components of an Information System Hardware, Software and Communication Links." Using Computers CS French Chapter 1. ETT 429 Spring 2007 Hardware/Software Basics. Agenda Technology Standards Review Technology Standards Review Results of Technology Self Assessment Results. 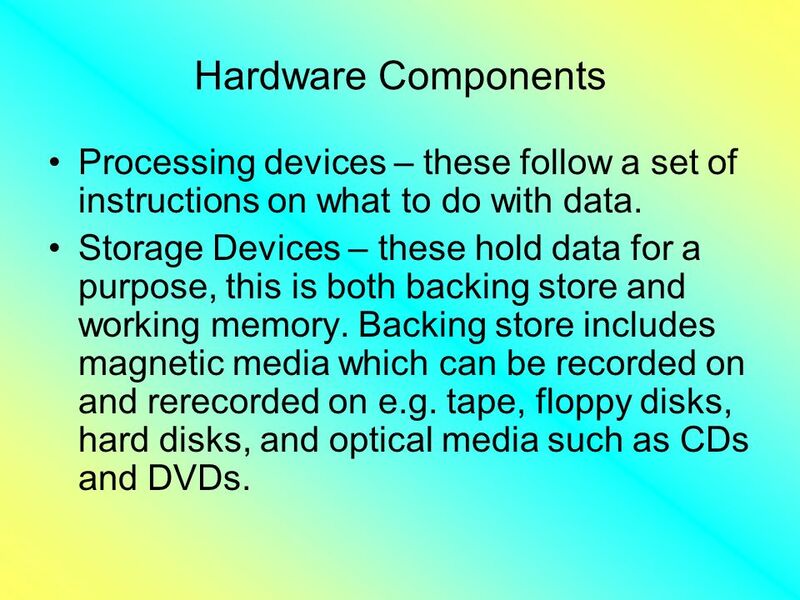 Computing ESSENTIALS     Copyright 2003 The McGraw-Hill Companies, Inc CHAPTER Information Technology, the Internet, and You computing ESSENTIALS. Computers What’s in there and how does it work?. Parts of a computer  There are many different parts to a computer. Some are inside the large case that. 1-1 Introduction to Computer Science Computer Hardware Components: CPU, Memory, and I/O What is the typical configuration of a computer sold today? Minia.